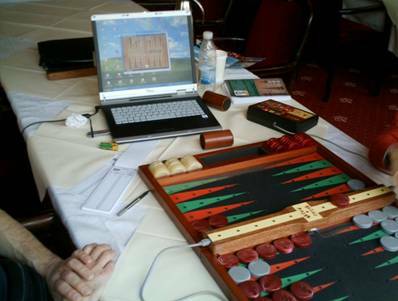 The special registration board for Backgammon “BEZMA®” and accompanying “BEZMA® Personal” software allows to record all game parameters during the play, represent such games in Internet and save them in digital form for later analysis. 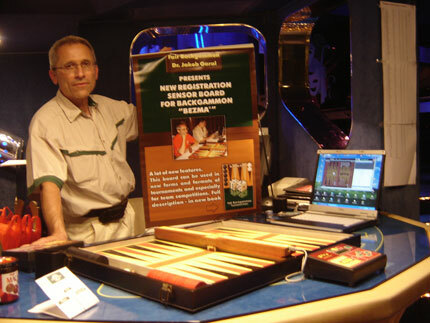 In addition, this full-scale game complex (board and software) gives a unique possibility to promote new forms and formats of Backgammon tournaments proposed in the book of Dr. Jakob Garal “Fair Backgammon Tournament Rules”, including team competitions. 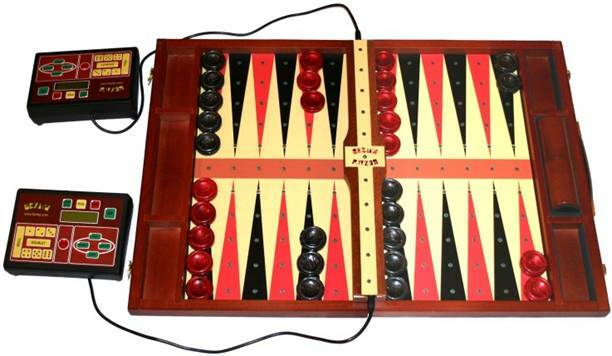 The invention consists of electronic panels that are inserted onto the surface of a backgammon board. They are connected by wires to two electronic consoles (one positioned next to each player) that the players use to punch in their dice rolls and cube actions. 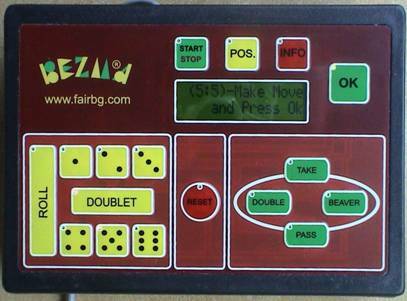 These consoles are connected via Bluetooth to a laptop computer which presents the moves in the “BEZMA® Personal” program on the computer. 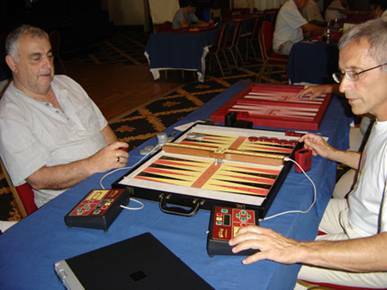 The computer can display the game being played on a big screen, or with an Internet connection, can show it through a backgammon interface on a website. The board components actually consist of two panels that were custom built to fit the playing surfaces of a real board and a third part that fits onto the bar. For the prototype a Rizzello and Romagnoli tournament size board was used. 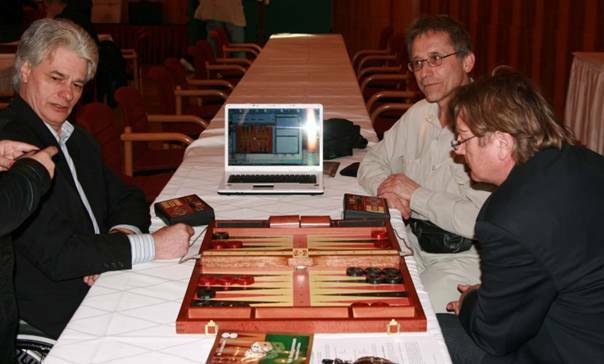 Dr. Garal revealed the board to the public for the first time at the 18th European Backgammon Championship in Velden, Austria on May 20, 2006. Dr. Jakob Garal demonstrates how the board works. The player then makes his move and presses the “OK” button to confirm his move. If a player makes a wrong move an error sound will be heard, otherwise, the console sends the signal to the computer and the move will be on display. The console also has another functions including the possibility to record the double and beaver proposals. At the end of a game, a match file is produced and can be immediately analyzed in GNU, Snowie, eXtremeGammon or another bot.